Fully prepared and externally painted prior to cladding. Externally clad in pressured treated 6″ x 1″ timber complete with border. Double Glazed aluminium framed sliding windows. External ‘Plug and go’ system to hook up power for the office. Fully insulated walls and ceiling. Choice of beige or white 11mm melamine wall coverings. Based on standard layout, additional options available on request. Fully converted shipping container to fully clad, fully insulated portable office. We have storage facilities throughout the UK to ensure we can beat any price. Call now on 0800 644 4242 for a delivery cost. 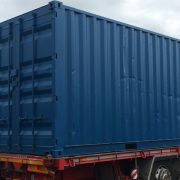 We offer all aspects of containers including Storage, Shipping, Offices, Canteens, Toilets, Motorbike houses, stables, generator stores and many more…..
No Job to small or big. We can ensure to get your container where you need it whether it’s as small as a 6ft store or as big as a 60ft Modular. We have many options available. If you’re not in a rush we can book your job in with another and save up to 50%. Unlike most container companies we will issue you with a 1 year guarantee on your container. Try our best to meet your needs. Also we throw in a free padlock (retails at £25.00) for free. Looking for more than 1. Let us know and we can offer you a huge discount. Not only will you save on your container but also on your delivery. We have a nationwide fleet of suitable vehicles to transport almost anything, no job is too large. CALL US FREE NOW on 0800 644 4242 for a NO OBLIGATION QUOTE. * All Prices are excluding v.a.t.